Do you want to make a book? Do you want to preserve your blogs? Maybe I’m slower than molasses, because I’m sure everyone and their dog already knows how to do this, but I’m still super stoked. Today I discovered a great website. 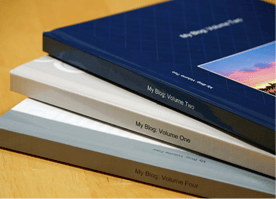 Blog2print! For $7.95 I downloaded my blog in a digital book format. Does it look professional and ready to sell on Amazon? No, but now I have this little eBook of all my posts and writings tucked away safe. I mean who knows anything could happen. My blog could get deleted or God forbid the internet could disintegrate. Their website has several options for soft and hardback books for a little more. You can upload pictures to put on the covers and select which posts to keep. Check it out, Blog2Print works for WordPress, Blogspot, Tumblr and Typepad. Let me know what you think. How to Turn Your Blog Posts Into an E-Book. Sounds like an interesting idea. One could also cut-and-paste each new blog post into a word processor or Scrivener file and when enough accumulates, create an e-book of it for free. It’s not difficult, as long as you remember the little step of cutting-and-pasting after each post. Cutting and pasting into Scrivener did occur to me, but it’s nice to know there is a program that will save my blog for me in it’s original form. Thanks, glad to know others are finding ways to save their work.